Researchers and policymakers have identified a number of effective interventions to keep students on track to college and career readiness in middle school so that they successfully transition into high school and postsecondary opportunities, from designing early warning systems to improving the quality of professional development for middle grades teachers. One strategy taking hold in states is increasing access to both career-oriented experiential learning opportunities and personalized career counseling. Maine, for instance, has expanded its CTE courses to middle school, and Indiana has a pilot program that uses an online career explorer tool that includes all middle school 8th graders. Nonprofit organizations like Spark and Citizen Schools* are also working across state lines, partnering with middle schools and local business to engage students academically and match them with career exploration opportunities. Federal policymakers are making moves on this front as well. 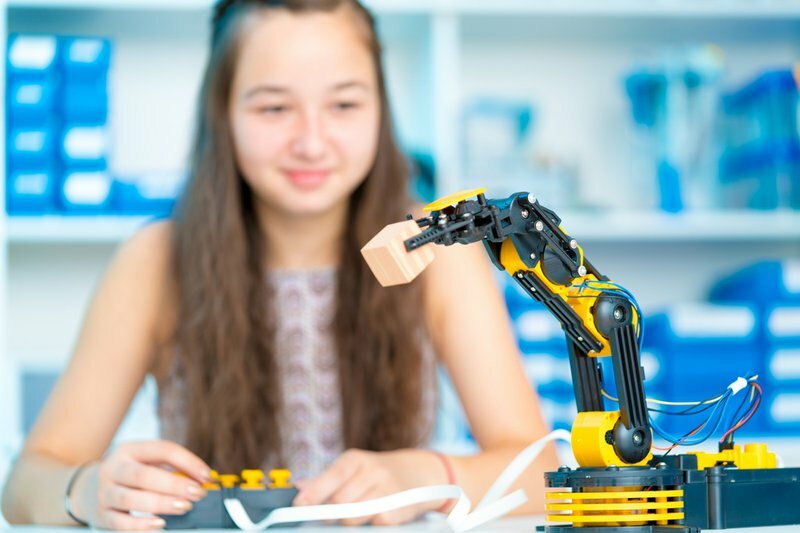 Last month, Senator Tim Kaine (D-VA) and Senator Shelley Moore Capito (R-WV) reintroduced a bipartisan bill—The Middle School Technical Education Program Act or Middle STEP Act—that would expand career and technical education exploration programs to middle school students. The bill, which Kaine and others have been pushing for several years, would create a pilot program for middle schools to partner with postsecondary institutions and local businesses in order to give students access to work and project-based learning opportunities. Additionally, partnerships funded through the Middle STEP Act would provide students with career guidance and academic counseling, as well as help them draft high school graduation plans that include coursework based on their career aspirations. Importantly, the Act specifies that middle school career exploration programs should be kept broad, and provide a pathway to a related high school career and technical education (CTE) course of study. This is an important caveat to ensure that pathways for students are both permeable (allowing students on and off ramps as their interests might change) and continuous (moving through high school, and perhaps even beyond). Exposing students to broad career fields could also help them make more informed decisions about high school course selection and graduation pathways, which have become even more important as options like early college high schools and high school CTE programs proliferate. The rationale for providing these types of supports is strong. For one, experiential and project-based instruction can significantly enhance learning. Based on 2015 NAEP data, “eighth-graders who participate in hands-on activities or investigations in science class every day or almost every day, as reported by their teachers, scored 12 points higher than students who never or hardly ever engage in these activities.” Career-oriented, experiential learning opportunities might help students stay engaged, too. According to a 2012 Gallup Poll, student engagement tends to drop the longer students are in school—in elementary school, about eight in ten students are engaged in school, that drops to six in ten in middle school. Experiential learning opportunities that connect what students are learning in school to the real world not only expose students to careers and the world of work, but can also engage students in their learning and help them understand how it connects to their future choices at a time when more students tend to disengage. Of note, the Middle STEP Act also champions the concept of apprenticeship. It encourages career education components to teach students about apprenticeship as a postsecondary and career opportunity. It also says that experiential learning funds can be used to provide students with ‘apprenticeships.’ But this is a step too far. Middle school is not too early to engage students about apprenticeship as a postsecondary learning option. But the idea of using the funds to support apprenticeship for middle school students bumps up against important norms and laws about what an apprenticeship is. First and foremost, all apprentices are hired as paid employees, which is why the legal minimum age for an apprentice is the U.S. is sixteen. The idea of a middle school student splitting time between on-the-job training, related classroom instructions (often at a college), plus meeting general education requirements is neither feasible nor desirable. Drivers license and transportation issues aside, employers resist hiring high school seniors as apprentices, let alone, 8th graders. While the Act might envision a lighter-touch, more age appropriate form of apprenticeship for middle school students, what it then envisions, is not an apprenticeship. Students should have access to shorter, more age-appropriate work-based learning experiences, with the opportunity to pursue a youth apprenticeship later in high school. Additionally the reintroduced version of the Middle STEP Act could be strengthened by linking the learning opportunities it funds with college- and career-ready standards. Just as experiential learning proponents posit that learning is better when linked to experience, the reverse should be true, also—experiential learning should be designed to complement academic learning. This has significant potential to enhance the relevance of standards-driven classroom instruction while ensuring the quality and rigor of experiential opportunities. Even with these caveats, the Middle STEP Act is a critical move in recognizing the significance of middle school and early career exposure. Providing federal funding, backed with the requirement for rigorous evaluation of pilot programs, would help add further insight to the current research about career exploration in middle school: Is there a minimum number of hours or days that students should be engaged in these activities to make them effective? How can schools integrate career exposure with rigorous, standards-based coursework? How permeable can any pathway approach be while still being effective? The middle grades have been proven to be a critical time for students’ academic and social and emotional development. If our top priority is to adequately prepare young adults for postsecondary opportunities—college or career—our efforts must begin much earlier than in high school, and the middle grades are a high leverage point to focus those efforts. *Before joining New America, Roxanne Garza previously held the role of Deputy Director of Public Policy at Citizen Schools.